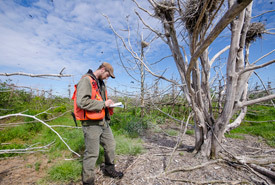 Josh Noseworthy records data amidst a double-crested cormorant rookery. The acidic cormorant excrement has killed a large portion of the spruce trees on Governor's Island, but they still provide excellent nesting habitat for cormorants and herons alike (Photo by Sean Landsman). Donations to support the development of conservation research partnerships are welcomed, and will support the Nature Conservancy of Canada's (NCC’s) small grants program. For more information, please contact Angela Parillo (angela.parillo@natureconservancy.ca). bridging the gap between conservation research and action by guiding the research community in Canada and beyond to ensure that research topics are relevant, and that conservation practitioners are engaged and informed by results.